Americans of both political parties agree with the guilty verdicts jurors made last week in the trial of former Trump campaign chair Paul Manafort. In the latest Economist/YouGov Poll just about half the country believes Manafort is guilty of the crimes he was charged with; only 6% think he is innocent. Republicans, despite their belief that Manafort is in fact guilty, do not look on the charges against Manafort as part of a legitimate investigation by the Federal Bureau of Investigation. By nearly two to one, Republicans view the investigation of Manafort as a “witch hunt.” But even those Republicans who say the investigation is a witch hunt accept Manafort’s guilt: 41% of them say he is guilty of the charges, while 20% think he is not guilty. But the “witch hunt’ allegations frequently tweeted by President Trump resonate with Republicans, though not necessarily with the rest of the public. Republicans view the Manafort investigation, as well as the investigation into the President’s attorney Michael Cohen, and the overaIl FBI investigation into the President itself as witch hunts. Republicans overwhelmingly call the FBI’s investigation into the President illegitimate. They reject the belief that the Cohen plea bargain in any way implicated the President. They do not think that “flipping” a witness should be legal. As has been the case for a while now, more than half the Republicans in this week think that the President is being framed by the FBI and the Department of Justice. But these opinions don’t make Republicans like Cohen or Manafort. Majorities of Republicans, like the rest of the country, have an unfavorable opinion of Cohen. 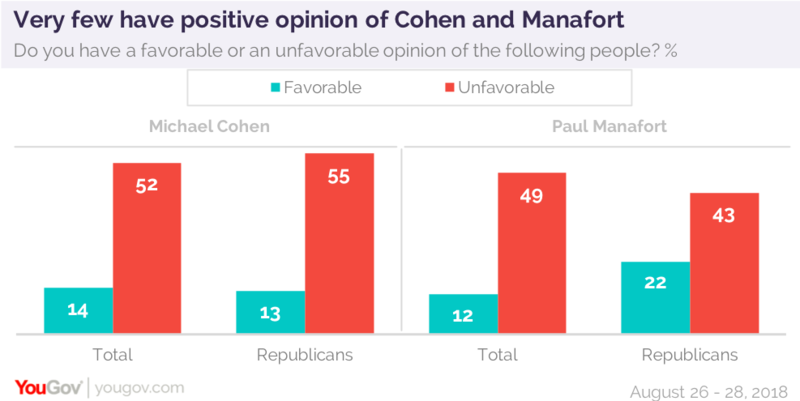 Republican opinion of Manafort is mildly better, though nearly twice as many are unfavorable as favorable about him, too. Republicans don’t reject the thought that what is being investigated could be crimes. While they divide on whether paying hush money to someone before an election to keep secret something that could influence that election is a crime, Republicans think that using campaign money to do that is a crime. It would also be a crime to make promises to foreign countries in return for campaign assistance before an election. But Republicans are less sure that asking a foreign country for negative research on an opponent would be criminal. As for the public overall, more see all of these actions as crimes. But while these actions might be criminal, they don’t necessarily rise to the level of impeachable offenses. There is broad agreement that perjury by a President would be an impeachable offense, as would obstruction of justice and abuse of power. 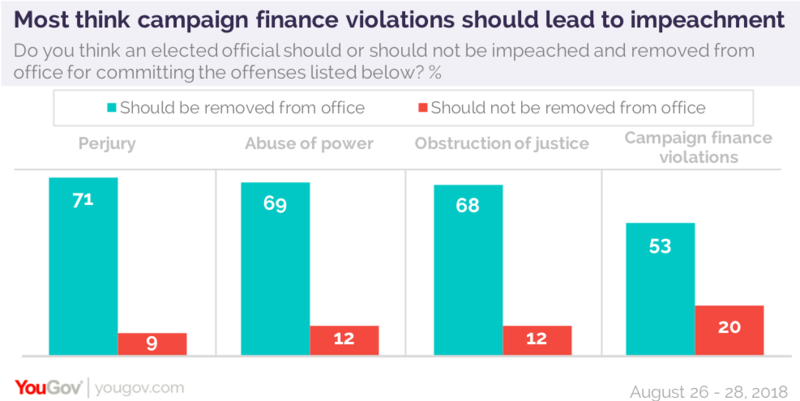 Half the public thinks violating campaign finance laws would rise to the level of an impeachable offense, but Republicans aren’t sure about that. More say tax evasion, using campaign donations for personal spending, and sexual harassment are impeachable offenses than say that about violating campaign finance laws. 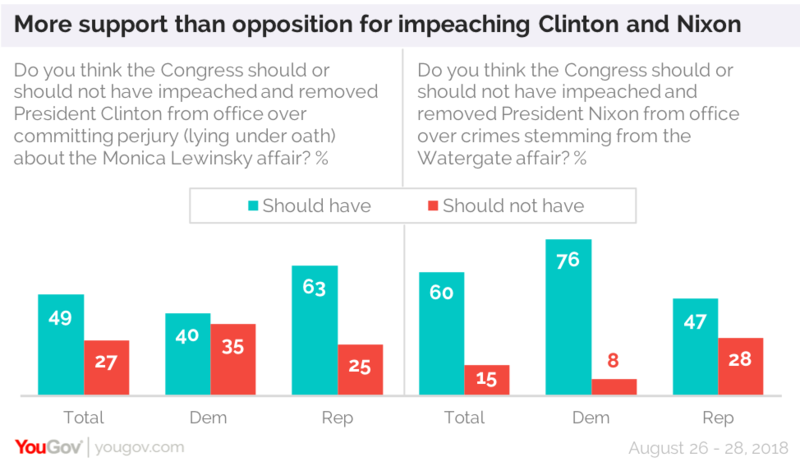 The country has soured on the two recent Presidents who have faced impeachment charges, believing both Bill Clinton and Richard Nixon should have been impeached and removed from office. Clinton was acquitted of perjury and obstruction of justice charges in 1999, while Nixon resigned in 1974 before he could be tried in the Senate for abuse of power, obstruction of justice, and ignoring a congressional subpoena. Today in both cases, the public, including members of each President’s own party, are more likely to think each should have been impeached and removed from office than not. 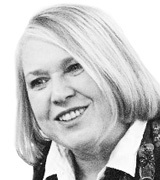 A good economy helped Clinton avoid removal from office. A good economy is helping President Trump, too. While the President’s overall approval rating remains within the narrow band around 40% (41% this week approve, 48% disapprove), he enjoys a positive assessment when it comes to his handling of the economy. 47% approve of that, while 37% disapprove. There is even approval from some non-Republicans. One in five Democrats approve of the President’s handling of the economy, along with two in five independents.